The vicious Swamp Slugs that lurk in Jargono are terrifying to behold ! These massive molluscs can grow to enormous size with an underbelly lined with razor-sharp mandibles and a maw filled with tiny grinding teeth to devour their prey ! Acidic mucus oozes from their gnarled skin to help ward off enemies and to aid in digestion once they have caught a meal. The Shadows of Brimstone : Swamp ... <lire la suite>. ATTENTION ! Ceci est une extension pour SHADOWS OF BRIMSTONE (SWAMPS) ! The vicious Swamp Slugs that lurk in Jargono are terrifying to behold ! These massive molluscs can grow to enormous size with an underbelly lined with razor-sharp mandibles and a maw filled with tiny grinding teeth to devour their prey ! Acidic mucus oozes from their gnarled skin to help ward off enemies and to aid in digestion once they have caught a meal. 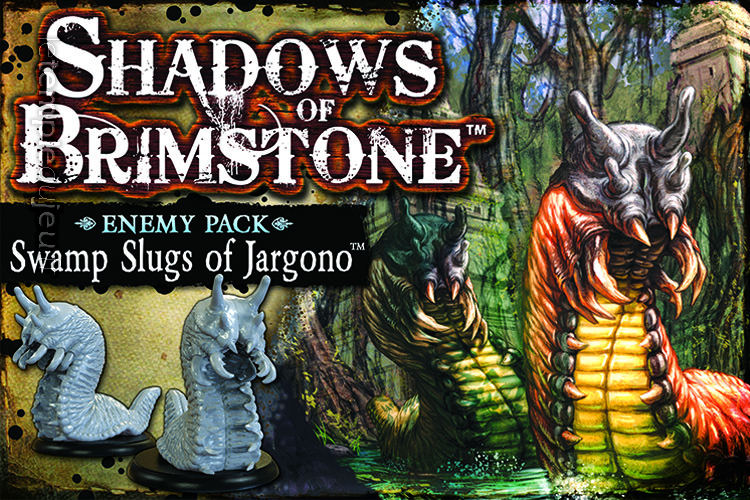 The Shadows of Brimstone : Swamp Slugs of Jargono Enemy Pack — which debuted at Gen Con 2015 under the name « Shadows of Brimstone : SECRET Enemy Set #2 » — contains everything you need to add the Swamp Slugs to your games of Shadows of Brimstone. There are three large Swamp Slug models included, as well as the large Enemy Record Sheet and all of the Threat Cards needed to add them to your games.